That's a damn fine looking machine KK. You getting wooden taps done as well? That'll be lovely. Can't wait to see it. I've tried both the Bezzera Strega and the Ponte Vecchio Lusso - both managed to produce better tasting shots than the visual characteristics of the pour would have suggested. Achieved more easily than my pump machines too. The ribbed (for her pleasure) taps are quite striking! Two projects currently in progress in our workshop. One photo shows mystery machine No1 at first look inside before starting any work. Machine has some "nice" (and I believe quite acceptable if an older machine is to be placed back into service) mods under the bonnet where they cant be seen and therefore dont infringe on the original look. This one wont be "rechromed" or "newified", its condition is good enough that cosmetically it only requires a clean up and will look great in virtually as original form. The condition is as it was pulled from a fully working cafe environment about 8 years ago. The second photo shows some "bare bones" work we have done to mystery machine No2 which is in "bottom of the harbour" condition. The brass bits are leaning on the machine's boiler, the over pressure valve is also lying there. The rest of the machine is all over the workshop in various stages of repair, and the body will need to be rechromed (unfortunately). I prefer good original if old condition, to "I restored it to within a millimeter of it looking as if it came off the production line this morning" condition, because the kind of finish you can end up with today is far superior to the original new look and can just make them look too new.....destroying the old world charm. OK, i'll play since no-one else has had a guess, mystery machine no.1 looks to be an old Boema, can't figure out mystery machine no.2, maybe some more parts pics? Is that "CREMA CAFE" on the perspex? I have seen one of these before, but cannot remember the manufacturer. I was thinking of a La Carimali, but not the model you referenced to. I do recall Fresh Coffee mentioning that he had a lever that he "might" be persuaded to part with, on a thread somewhere her, but memory fails me as to which machine he referred to. He did say it was in good condition, so it might be this machine. The other is not the Granluce which will have to wait a while. Decided to start on another one that we have. We are a bit miffed as to how we are going to get any parts for it as it is extremely rare. Cant even find a photo of it to help with the resto. Note rarity doesnt mean anything is worth anything much....just that something is rare! Although if we ever decide to sell it, I guess we will hope that it fetches a nice price. At this stage, no plans to sell either. Wow, WTF is that hand grinder ? Home made jobby ? OE Pharos. Great grinder and with a few mods even better! 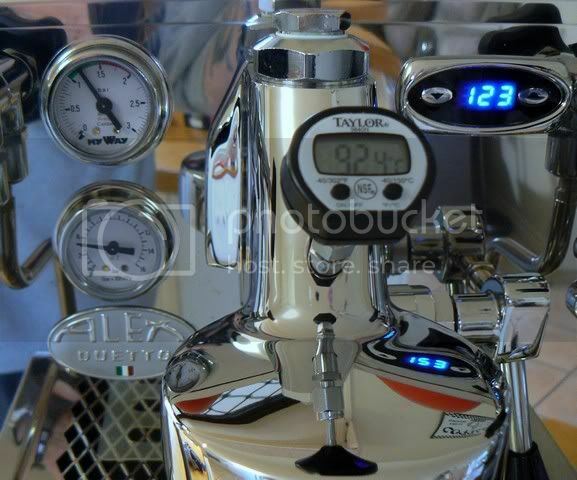 On Home Barista voodoodaddy has some mods that make the Pharos really shine.